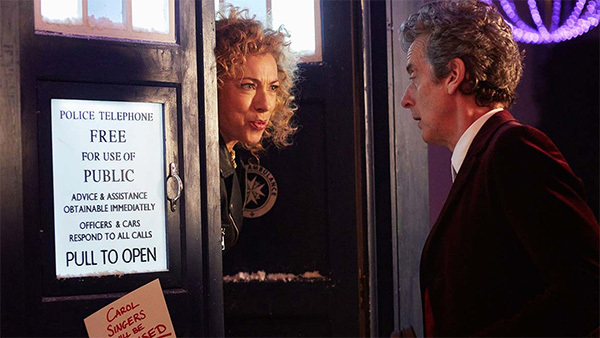 Doctor Who: The Moffat Scripts – THE HUSBANDS OF RIVER SONG | Warped Factor - Words in the Key of Geek. With comedy antlers in place, Dr. Moo loses his head. Following on from the tragic ending to Hell Bent and the death of Clara, The Husbands of River Song could have been a bleak affair as the Doctor struggles to cope with being companionless again. 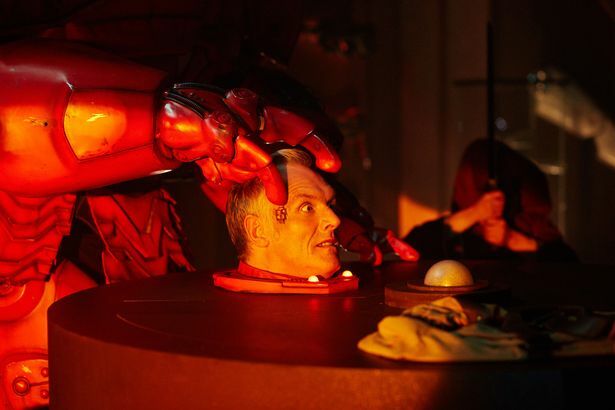 But thankfully Steven Moffat decided to go the other way entirely and let the Doctor have a bit of fun, something we haven’t seen since he last regenerated two years earlier. 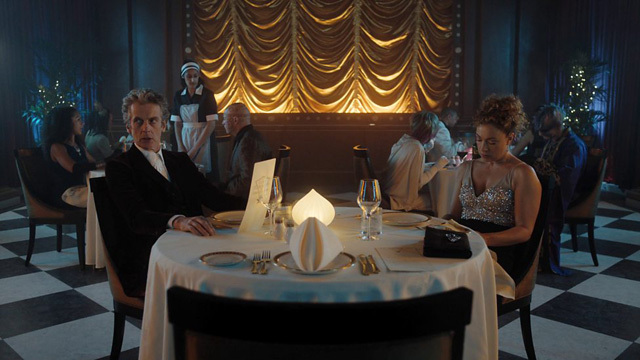 The tone is set for The Husbands of River Song within its first scenes. 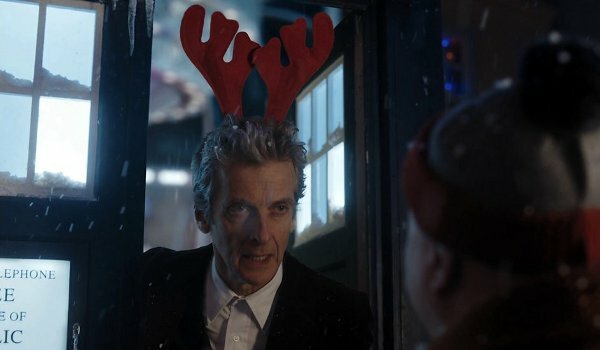 We see the Doctor’s sign whic reads “Carol Singers will be criticised” and the sight of Matt Lucas walking towards the TARDIS, which has given the Doctor a pair of holographic comedy antlers, further cements the idea that this will be a bit of a silly installment. 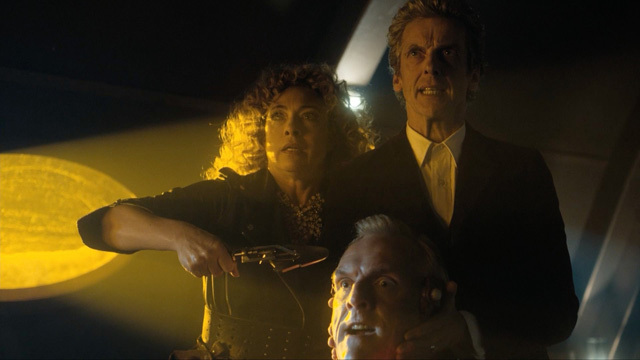 Within a few moments of that we see him come face-to-face with his wife River Song, who doesn’t recognise him, and her other husband King Hydroflax, who is reduced to being just a head attached to a giant robot. Then we learn that River is trying to steal a diamond from inside Hydroflax’s head and thus kill him in the process. Helping her with this is husband number three. There’s your premise, now have fun! Mummy, mummy, how did they do that special effect? The idea of having space and time as an open book wherein the Doctor and River may cross paths occasionally is a brilliant one and something that the TV series had never really played with before, so I welcome the change to seeing what is in effect a River Song story (in that the Doctor is unknown to her and just tagging along for the ride) and all that that entails. It’s telling that Big Finish moved the release of The Diary of River Song Series One forward to Boxing Day to tie in with this episode because in it they offered more of the same – even if they did put the Doctor into the final story of the set. Ask yourself what your loved one does when you’re not around to watch. If your loved one is River Song then it’s entirely possible she’s married at least three other men (including Stephen Fry) and at least two women, a pretty bleak thought for the Doctor to consider. Peter Capaldi convincingly sells the barely-concealed jealousy and pitches his facial expressions just right. But it’s not as bleak a story as that may sound because this is a full-on comedy for at least the first 45 minutes of the 60. We’ve got a robot that switches heads, a screaming decapitated man in a bag, River pouring out gushing praise (think Ten & Rose and you’re halfway there) but dropping the act as soon as she’s out of earshot, a man who keeps his money literally in his head… it’s all a load of running, shouting, banter and innuendo and every joke you can think of about losing your head gets a mention. So in effect it’s only a standard River/Doctor scene extended for a full episode then? Well, technically yes but there’s something different here. The chemistry between Alex Kingston and Matt Smith was always electric and the sparks between them leapt off the screen, but when Kingston is paired up with Capaldi it’s something else. I can’t quite put my finger on what that is but whatever it is I like it a lot! And then there’s the TARDIS scene when the Doctor finally gets to do the obliatory “Bigger on the Inside” response for himself. RIVER: I know where you're going with this, but I need you to calm down. RIVER: You've certainly grasped the essentials. DOCTOR: My entire understanding of physical space has been transformed! Three-dimensional Euclidean geometry has been torn up, thrown in the air and snogged to death! My grasp of the universal constants of physical reality has been changed forever … Sorry, I've always wanted to see that done properly. And that’s when it all kicks off. That’s when he has to take her to Darillium. That’s when he is forced to take her on a date to the Singing Towers and give her the sonic screwdriver she will have when she dies at the Library. Here at last, Moffat allows his longest ever story arc to come full circle as he fills in the final gaps in the narrative. The way said narrative played out wasn’t to everyone’s tastes but I rather enjoyed it. So while River’s story has now reached a satisfying end with all the gaps filled in and the circle completed it feels, to some, like it should have ended earlier and been more tightly focused. But for me, I have no trouble with it. River Song was, is and always will be one of my favourite ever supporting characters from any TV show ever. And if you want a hand in following her timeline then here’s a helpful article from the good people at Radio Times. So do I have any issues with The Husbands of River Song then? Only the one actually, and that’s how Greg Davies is underused and a bit on the hammy side. That said, he always gets a free pass from me because he’s so much fun in Cuckoo so I’ll forgive him. It’s clear that he’s having a lot of fun in this episode too, and he’s not the only one, and when the cast has fun so does the audience. The Husbands of River Song is one of the best Christmas Specials of Doctor Who so far. It doesn’t knock A Christmas Carol from the top of the pantheon but it’s the closest that any of the Christmas Specials have come yet. It’s a fun episode with a fantastically well-handled emotional core which fills in the two remaining gaps in an ongoing story arc, so I can’t complain. Overall it’s yet another great episode, bringing 2015 to a head (buh-dum hiss!) as one of the best years ever to be a Doctor Who fan.